The immediate effects of the 2010 Deepwater Horizon oil spill were easy to see: tar-covered beaches and wetlands or pelicans caked in brown goo. But the worst damage took place out of sight at the bottom of the Gulf of Mexico. Three years later, a group of researchers from the University of South Florida are examining the spill’s aftermath, and are now starting to piece together the long-term effects of oil on the entire Gulf ecosystem — from huge whales to single-celled animals. Journalist David Levin spent 8 days at sea with that team of chemists, engineers, and biologists as they began to assess the overall health of the Gulf. Originally aired on PRI’s Living On Earth, April 26, 2013. Funded by a grant from the University of South Florida’s College of Marine Science. CURWOOD: It’s Living On Earth, I’m Steve Curwood. Just three years ago, on April 20th , a deep water BP oil well in the Gulf of Mexico burst open, spewing over 200 million gallons of crude into the Gulf, fouling beaches, fishing grounds and the sea-bed. Now science is trying to understand exactly what effects a spill like this has on the marine ecosystem. One collaboration of chemists, engineers and biologists, at the University of South Florida, is called C-IMAGE, which stands for the Center for Integrated Modeling and Analysis of the Gulf Ecosystem. Since August 2012, the C-IMAGE team has been collecting samples in the Gulf of Mexico, and reporter David Levin went along with them. His story comes to us from Mind Open Media. LEVIN: It’s 9 a.m., and David Hollander is driving me around St. Petersburg, Florida, listening to the morning news. Hollander is a marine chemist at the University of South Florida. We’re running some last-minute errands. 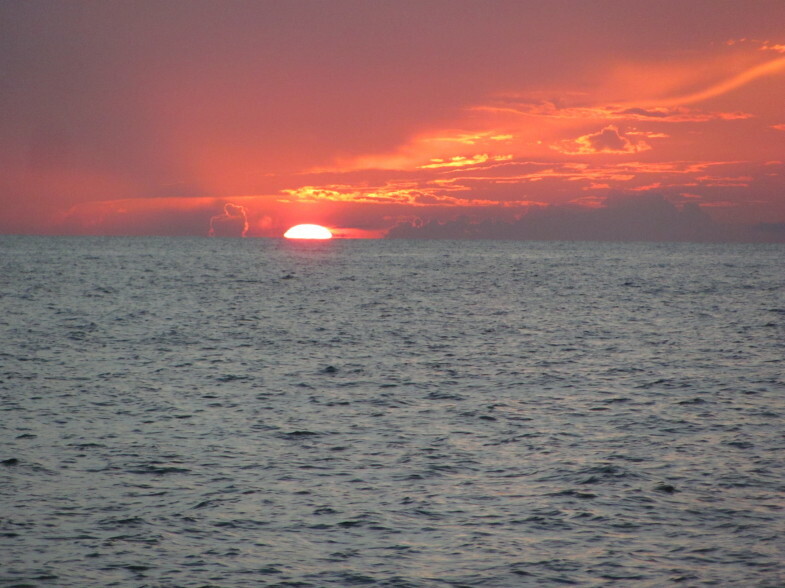 In a few hours, we’re shipping out for an eight-day research cruise in the Gulf of Mexico. But first, we’ve got an important stop to make. The wig store. HOLLANDER: We’re picking up Styrofoam heads. It’s for research, believe it or not. CLERK: [LAUGHS] OK, good luck to you. Take care. LEVIN: This is something of a tradition – on the research cruise, Hollander and his students will attach the heads to instruments they’ll lower down to the ocean floor. 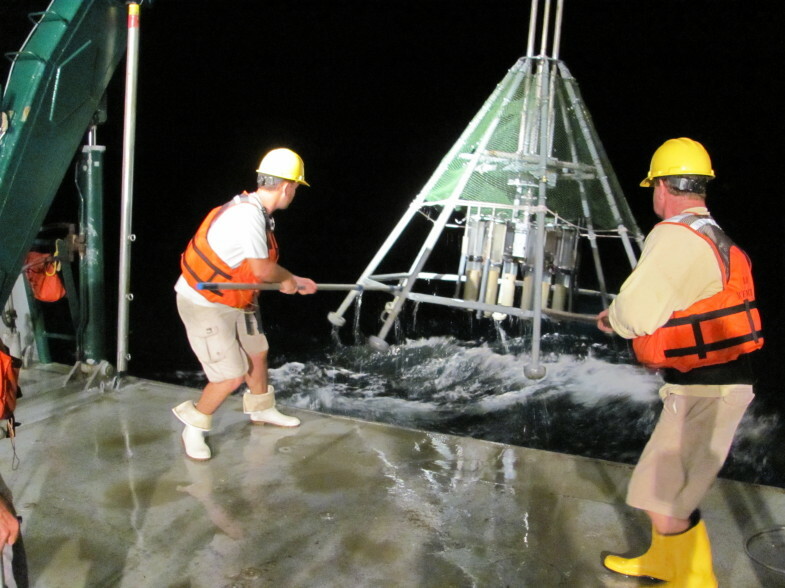 C-IMAGE scientists Patrick Schwing and David Hollander help bring in a multicorer, a device that samples sediment from the ocean floor. Inside the frame are eight thick plastic tubes that sink into the mud when the device hits the bottom, sealing the sediments inside. The samples will help Schwing and Hollander determine the extent to which oil has affected the ecosystem at the bottom of the Gulf of Mexico. HOLLANDER: …and the heads, because of the pressure, shrink to about a third their size. And if you paint them nicely, it turns out to be quite a memento. LEVIN: The plan is for these heads, and the instruments, to descend to the source of the Deepwater Horizon spill, at the bottom of the Gulf of Mexico. Back in April 2010, a floating rig owned by BP exploded. It sank a mile down to the bottom, leaving a broken wellhead on the sea floor about 40 miles off the Mississippi Delta. For three straight months, oil sprayed up from the wellhead to the surface, and as it rose, vast plumes of toxic chemicals and oil droplets broke off, staying suspended in the seawater at different depths. They drifted around the Gulf like toxic clouds. HOLLANDER: This is not a black layer in the ocean. It doesn’t even look like vinaigrette when you bring it up – it looks like crystal clear water. And the reason is because they were such fine droplets, that you couldn’t see them. LEVIN: The underwater plumes eventually floated into the continental slope. That’s where the ocean floor drops out dramatically – it falls from a few hundred feet deep to a few thousand. When the plumes hit the slope, they left a smear of oily residue. Hollander and his team are using this cruise to visit those oil-soaked areas. 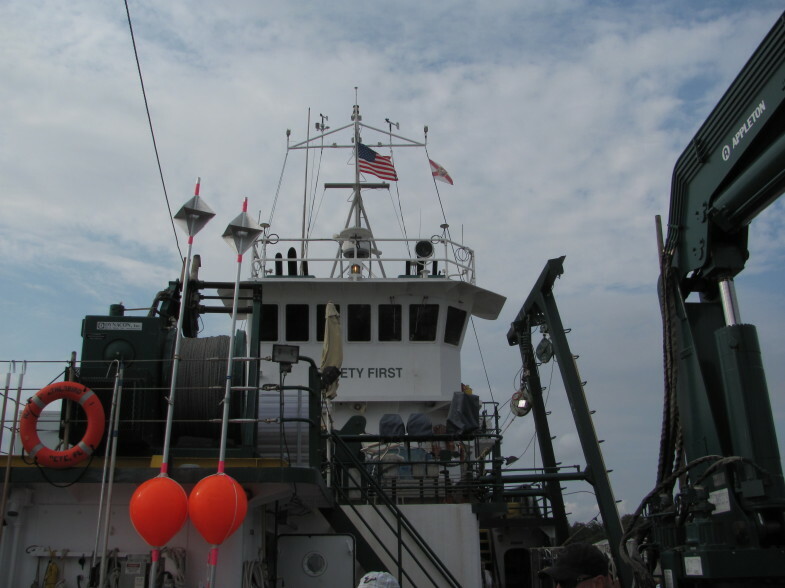 Their mission: collect both sediment and fish to measure the plume’s impact on the Gulf ecosystem—from huge whales to tiny single-celled animals. This project’s part of a larger research effort Hollander helped start at USF. He’s organized scientists from around the world to study the aftermath of the spill. The group calls themselves C-IMAGE… And this cruise is the first part of their collaboration. LEVIN: For the next eight days, our home base will be here, on the Weatherbird II, a 115 foot research vessel. LEVIN: That’s Matt White, the ship’s captain. We’re about to set sail for an area of the sea floor called the Desoto Canyon, about 60 miles southwest of the Florida panhandle. It’s one of the places where the oil plumes bumped into the continental slope. By midnight, we’re at our first stop. Hollander’s team lowers a device called a multicorer into the water. It’s a metal frame about 10 feet tall. LEVIN: Patrick Schwing is a post-doc in Hollander’s lab. He’s watching the multicorer disappear under the waves. When it hits the bottom, eight plastic tubes inside it will grab mud from the seafloor. SCHWING: …and at that point we start pulling it back up. LEVIN: These coring samples are crucial for understanding how the spill moved around the Gulf. They’ll help the team predict what happens to oil after a deep water blowout, and how long it’ll last in the water. But the life of the oil is only half the picture. To understand its impact on the ecosystem, the team needs to know how fish and other animals are faring. MURAWSKI: Look at that sunrise. That’s sharp. LEVIN: The next day, at 6 in the morning, Steve Murawski stands on deck, holding laundry baskets full of bait. LEVIN: Murawski is a biological oceanographer at USF, and he’s running this research cruise along with Hollander. He’s setting up for a long day of fishing. His team is using a winch the size of a 50-gallon drum to let out five miles of metal cable. Strung out along the cable are 500 baited hooks. It’s a technique called long-lining. As the cable spools out, it settles across the bottom, attracting fish that live near the oily sediments. MURAWSKI: It’s a unique opportunity to see what’s going on with the fishes in the really deep water. We know that there’s oil on the bottom. What we’re trying to see is if that oil is having any food chain effects. LEVIN: Murawski thinks the toxic chemicals may have been absorbed by tiny animals that live in the sediments…like clams, snails, and worms, which all get eaten by fish. So if there’s any oil lower down in the food chain, it might end up in the fish. If it does, Murawski wants to know. So he’s taking samples from all the species he catches on his long line. MURAWSKI: So what we’re going to do is look at the bile, the blood, the liver, the muscle, and then some of the organs of the fish. So that should tell us number one, is there active oil in the environment, and number two, is it being uptaken by these fish, some of which are of commercial importance. LEVIN: One by one, fish come off the long line and flop onto the deck. Red snapper, Dogfish. Eels. Grouper. Tuna. This part of the research is grueling. Murawski and his students work in 100 degree heat, cutting out fish guts so they can test them for chemicals from the oil.…and when they’re done with that, they reach for the bone saw. 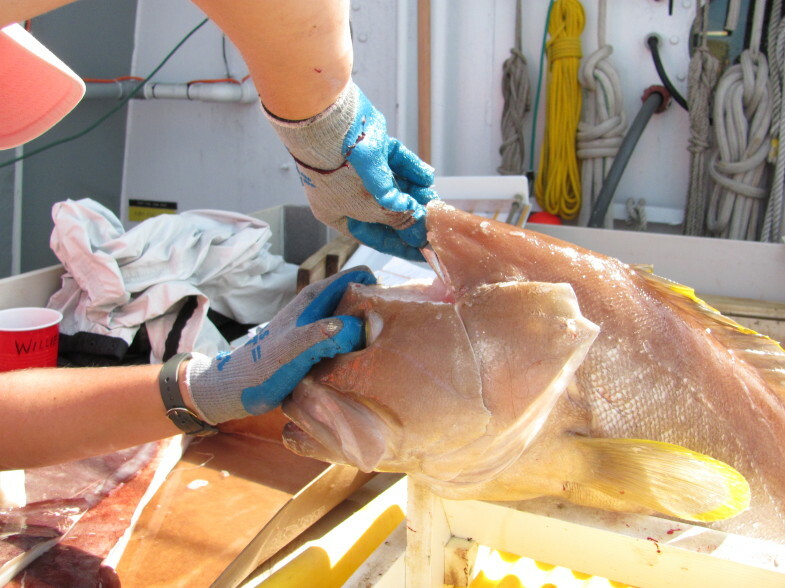 LEVIN: Liz Herdter, one of Murawski’s students, just split open the head of a yellowedge grouper. She uses tweezers to pull out delicate bones from its inner ears. They look like tiny oyster shells. HERDTER: These are otoliths. They’re like an earstone. Steve likes to call it the flight recorder. LEVIN: That’s because a new layer of bone forms around an otolith every year. They’re laid down like the rings of a tree, and by analyzing these layers, you can track the health of the fish over time. HERDTER: If they came into contact with any chemicals, there’ll be a chemical marker, so they’re a really neat way to determine what’s been happening in the life of the fish. LEVIN: Murawski’s team wants to use these samples to create a big-picture view of fish and ecosystem health in the Gulf. Even today, some fish are still in bad shape… Like the 50-pound red snapper Murawski’s holding. It’s got a skin lesion. MURAWSKI: It’s also got a bad eye! See his eye? His eye’s gone. So this is the kind of fish we want to investigate for whether it has any relationship to oil or not. LEVIN: Sick fish like this one don’t surprise Murawski. He thinks their bad health is connected to what’s going on in the sediments, and Hollander just found some evidence to back that up. At a work table crammed into a corner of the deck, Hollander points to one of the cores his team pulled up the night before. It’s a clear plastic tube, about two feet long and six inches wide. It’s full of grey mud, where tiny worms, snails, and clams have burrowed, mixing it all up… But a few inches from the top, that uniform grey suddenly turns brown. And that, he says, means trouble. HOLLANDER: What this really represents is where the subsurface plumes actually touched the sediment surface. LEVIN: When the plumes hit the sea floor, they wiped out the tiny creatures that usually mix up the sediment. So after the spill, all that churning activity ground to a halt. HOLLANDER: If there were organisms mixing this, you wouldn’t find these distinct layers, so those organisms are gone. LEVIN: In some parts of the Gulf, they still haven’t come back. And since some fish live in and near the sediments, Hollander thinks the chemical plumes probably affected them, too, causing the liver problems and skin lesions Murawski’s been seeing. But it’s hard to know for sure. Figuring out what the toxins may have done to the fish is a challenge, and it’s tough to pinpoint which chemicals could be the culprits. HOLLANDER: You know, you have to be able to trace the oil from its origin, through the water column, onto the sediments, and then as that material degrades, how do you follow it? Not that easy. LEVIN: The C-IMAGE team still has a long way to go. Over the next three years, they’re planning a few more research cruises that will take them back into the Gulf. And next time, Hollander promises to do something with those Styrofoam heads – which we painted onboard this cruise. 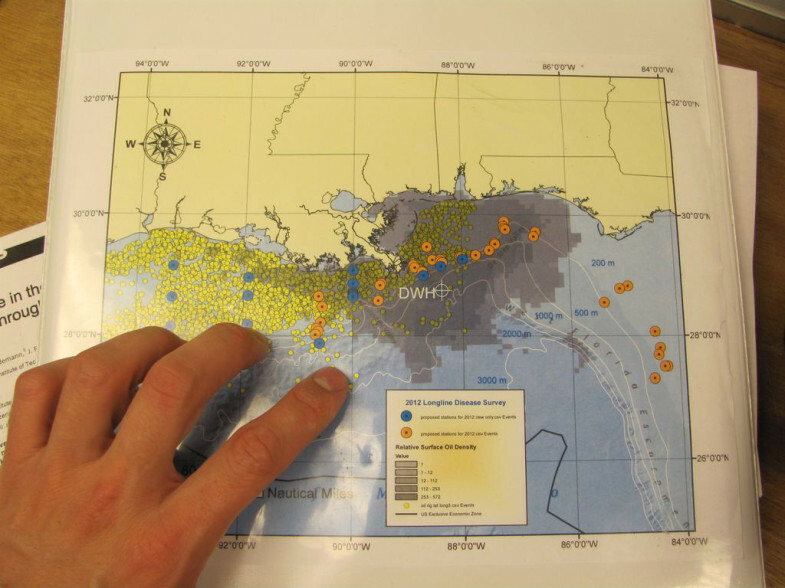 He plans to lower them to the seafloor at the exact site of the Deepwater Horizon spill. In a way, he says, he’ll give those inanimate heads a look at what’s going on down there – just like he and his students are doing from the surface. For Living on Earth, I’m David Levin in Tampa Florida. CURWOOD: David’s story comes to us from Mind Open Media. To learn more, head to our website, LOE.org. Aired nationally on PRI’s Living On Earth, April 26, 2013. Funded by a grant from the University of South Florida’s College of Marine Science.